The beautiful image on this Chorus Howl mirrored box is from the Artist Anne Stokes. It is made of fiberboard and covered with a poly vinyl finish. 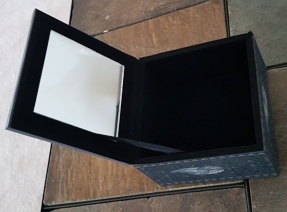 The inside top has a mirror and it is lined with black felt. Makes a great little trinket box with a gift of Wolf jewelry.